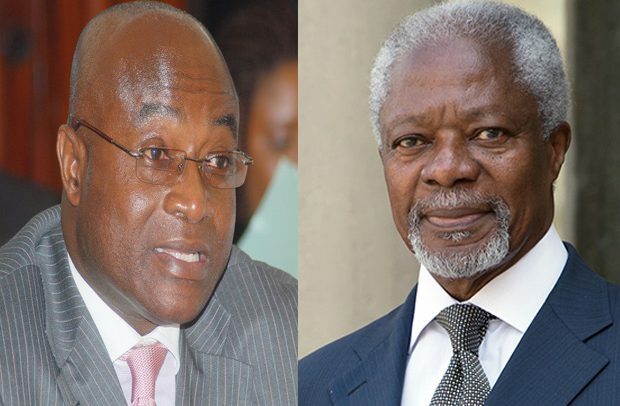 As the mortal remains of the late former Secretary-General of the United Nations (UN), Kofi Annan arrives today, the Majority Leader in Parliament, Osei Kyei-Mensah-Bonsu, has paid glowing tribute to the illustrious son of the land, describing him as the ‘diplomats’ diplomat’ who contributed immensely to peace in the world. He said the late Kofi Annan played a critical role in many key events of the late 1990s and 2000s in a bid to create a more peaceful, humane and just world. “Mr. Kofi Annan was a shrewd but tough negotiator and a consummate strategic thinker who assumed office when the United Nations was exfoliating amidst a fractured relationship with its host country, United States of America,” he said. According to the Majority leader, when Kofi Annan took over as the boss of the UN, the US held back its funds for the UN which affected the ability of the international body to perform some of its core responsibilities. “It’s to Mr Annan’s credit that before his term ended he had repositioned the world organisation, particularly restoring and stabilising relations with many prominent member states,” he said, adding that the financial position of the UN also rebounded under his leadership. According to Osei Kyei-Mensah-Bonsu, Kofi Annan led the organisation to unveil bold and strategic imperatives with profound positive impact on people in many countries, notably in the areas of health, water and sanitation, education, food security and social upliftment. “Kofi Annan was successful; the UN was hugely successful such that the Nobel Peace Prize came to be bestowed on Kofi Annan and the UN jointly,” he said, adding that Kofi Annan left huge imprints in world politics and international diplomacy. He said Mr Kofi Annan, who replaced the first African Secretary-General, Egyptian-born Boutros Boutros Ghali, was a master strategist and tactician who did not allow himself and the UN to be subverted.